The phrase “Netflix and chill” is a slang term that has spread beyond the internet and into general use, much like “selfie,” one of the top 10 buzzwords of 2012 (doesn’t it feel like you’ve been hearing that word forever?). The main value proposition of Netflix is the ability to stream TV shows and movies. But imagine if every time you logged into Netflix, you had to search through their thousands of TV shows and movies that were in a random order, or alphabetized. It would be frustrating and people wouldn’t stick around to find what they were looking for. It’s the overall user experience that really draws you in, since Netflix personalizes how they show you their selection. Finding Learning within the company course catalog should be as easy as finding a TV show to watch. That’s why we have completely redesigned the SAP SuccessFactors Learning Catalog. We have harmonized the experience to make discovering learning easier. With sections for featured courses and highly-rated courses, and the ability for Learning admins to create categories to fit their business, learners will have an easy and pleasant experience whether browsing for learning or doing specific searches. With every release, we continue to innovate in our Learning solution to ensure that organizations and learning professionals are better enabled to instill a culture of continuous learning. The newly redesigned Learning Catalog is just one way we are focusing on making learning opportunities and content easier to discover and consume. 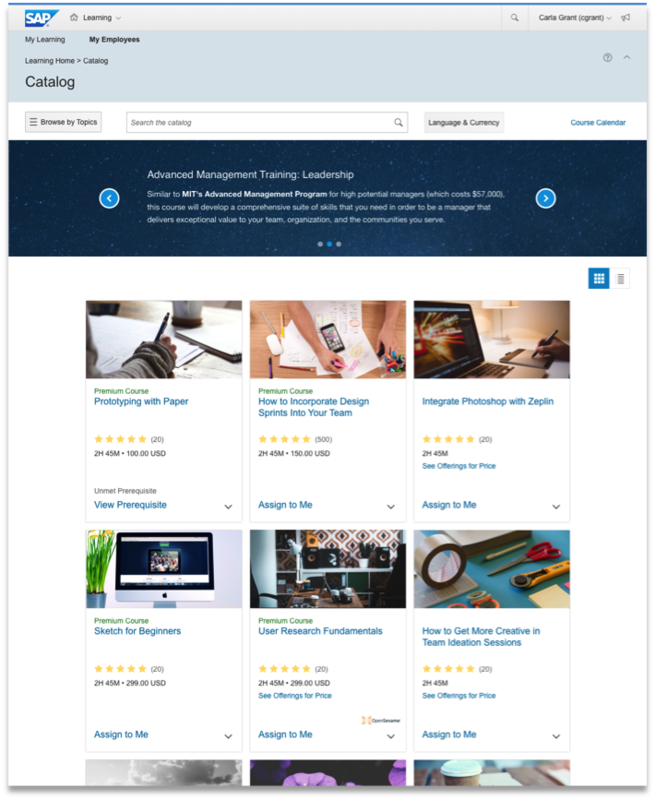 To learn more about the new Learning Catalog and the other major Q4 updates to the SAP SuccessFactors HCM Suite, check out the release video here and the release highlights blog here. Plus, don’t forget to check out the latest report from Gartner, where SAP SuccessFactors received the highest score in two use cases in the Critical Capabilities Report for Cloud HCM Suites for Midmarket and Large Enterprises.